The name and bottle sold me on this beer when I bought a mix-and-match six pack in Chapel Hill when I went to visit my son at UNC. I wanted to try some new beers with grilled foods and barbecue, and the options are limited here. Angry Angel Beer is made by Big Boss Brewing Company out of Raleigh, North Carolina. The company started up in 2006 with the first beers sold in 2007. Ironically, one of the founders is a graduate of UNC even if they are bottling over in Wolfpack country (NC State - Raleigh - Go PACK). Angry Angel is considered a Kolsch which means that it's a German style beer. They do know their beer over in Germany. I went to Octoberfest when I lived overseas. Now, that's a party for sure (even if they don't have barbecue). 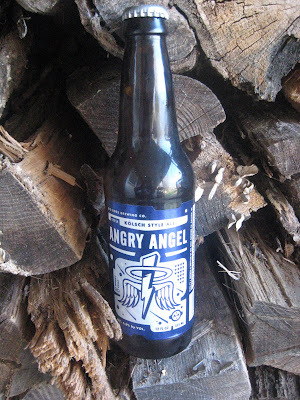 Some of my random pick beers weren't so great, but I did like Angry Angel. It's stronger tasting than the typical American beers like Budweiser, but it's not gaggy like a couple I put in my sixer container. You get a little citrus kick with the first taste and just a hint of yeast. It's not over layered with too much going on like some. Just smooth and easy to enjoy. You get that hoppy beer back bite but a pleasant one and not overpowering. Angry Angel would be a good pick for a barbecue. It won't kill your taste buds which defeats the purpose of having beer with your barbecue. (Just have a stout old beer and let it go at that if you don't care about the food.) If you want to savor the grilled stuff, then you get a smooth flavor with Angry Angel and enough kick to add some balance to even spicy foods. Enjoy some barbecue beer humor and a list of other beers I've reviewed here at Barbecue Master.